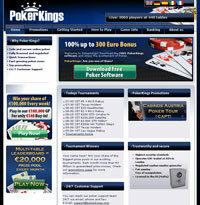 Poker Kings is a good example of the ultramodern online poker websites that have been created within the last 3-5 years. It is not the oldest poker site around and it has lower traffic numbers, but there are still many reasons to enjoy this particular online poker website. Poker Kings operates under a software license that was granted by Boss Media. Boss Media is a newer software provider in online poker and as a result their online poker network is one of the smaller ones you’ll see online. Nevertheless, their software package is absolutely beautiful. The graphical rendering, the interface and the functionality are all points that Boss Media has over just about any other software package out there. Only time will tell whether this will allow them to gain market share, but the main point to take from this section is that for Poker Kings the software package is definitely a big strength. The Boss Media Network carries many different games. There are Texas Hold ‘Em, Omaha, Omaha Hi/Lo, Seven Card Stud, Five Card Stud and Five Card Draw tables available in the software lobby. However, you need to realize that the Boss Media Network is actually quite small right now. This means that even though those tables may be available and the tournaments may be going through, it is also true that the Boss Media Network does not have the traffic to keep them going around the clock. Even during peak hours, you may not find the game that you want at the limit that you want. They’re all there though, so it is still worth a shot. Poker Kings is an interesting online poker site from a promotional point of view. The deposit bonus that they offer for new players is worth 100% up to EUR 300.00 on the first deposit that you make at Poker Kings. Once you’ve burned through that deposit bonus, there is also a loyalty program that you can use to get into special tournaments and win some extra cash. Reload bonuses are not that often, but there is also a freeroll tournament for new players with an EUR 1000.00 guaranteed prize pool added. 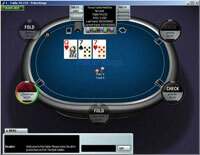 Players from the United States are not allowed to play online at Poker Kings. Support is available around the clock at Poker Kings. You can get it from help files available on the website. You can get it through e-mail by contacting support@pokerkings.com. Finally, you can also get it by long distance telephone (35-627-780-103) or toll-free telephone in Germany (49-0-8006644876), United Kingdom (44-0-800-1700530), Austria (43-0-800-802044), Switzerland (41-315-500-354) and Spain (34-900-804878). Poker Kings is a great online poker website that has a lot going for it. The main drawback it has is the small size of the Boss Media Network. That should change in the future though and as this nascent network begins to grow faster, Poker Kings will quickly escalate up through the rankings of online poker websites.